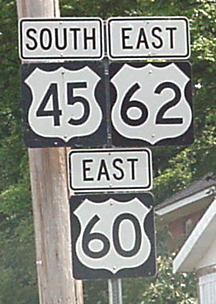 This US 57 sign located at Clintonville, Ky., in Bourbon County, should be a KY 57 sign. I've seen a couple of other US 57 signs in Bourbon County, too. This photo was taken in 1997. UPDATE: This goof had been repaired as of May 1999. 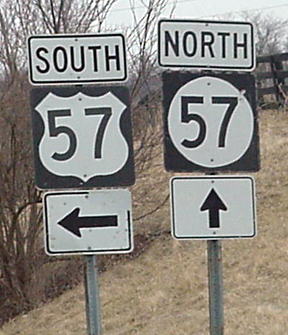 This sign is now the correct KY 57 sign. 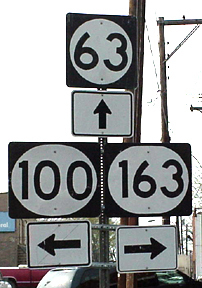 All the incorrect US 57 signs in Bourbon County have been corrected as of spring 2000. This KY 460 sign should be a US 460 sign. It's located in Johnson County, Ky., just west of the US 23/US 460/KY 40 interchange near Paintsville. The photo was taken in September 1997. UPDATE: This goof had been repaired as of December 1999. 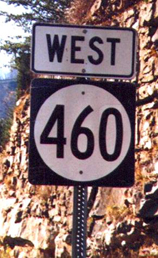 This sign is now the correct US 460 sign. 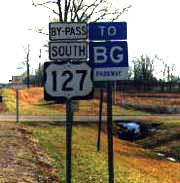 This KY 127 sign should be a US 127 sign. 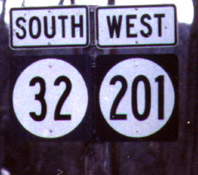 It's located in Owenton, Ky. Notice the peeling of the Type III reflective sheeting, and the difference in fonts between the "2's" in the KY 22 and KY 227 signs. The photo was taken in summer 1998. UPDATE: Due to a reconstruction of this intersection, this sign has been removed as of December 1999. 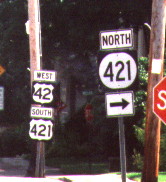 This KY 421 sign should be a US 421 sign. 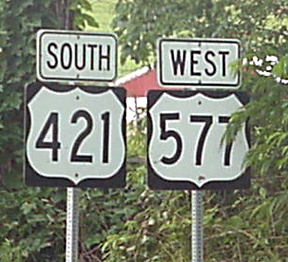 It's located in Bedford, Ky. A correct US 421 sign can be seen to the left of the erroneous sign, below the US 42 sign. The photo was taken in summer 1998. This US 80 sign should be a KY 80 sign. It's located in Logan County, Ky., west of Russellville. 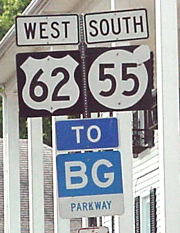 There used to be several US 80 signs on US 68/KY 80 between Bowling Green and Hopkinsville, but this one is the only one left. The photo was taken in May 1998. UPDATE: Due to reconstruction of US 68/KY 80 in this area, this goof was gone as of spring 2000. This sign is located in Irvine, Ky., where I worked for nearly eight years, and is only 14 miles from where I grew up. Some history: Estill County is known for its old iron furnace ruins. Years ago, Estill County was a major producer of iron. This sign directs tourists to some "furnance" ruins. It has been up for more than 10 years and as far as I know, no one has ever complained about it or mentioned it to the highway department. The sign which covers the bottom right corner of this one gives directions to a church, but I couldn't get a photo of this sign without that one being in the way. The "furnance" sign itself is located at the intersection of KY 52 eastbound and KY 1571 in Ravenna, Ky. The photo was taken in winter 1998. UPDATE: This sign was fixed as of May 1999. A new sign with "furnace" spelled correctly has been installed. Blue Grass Parkway signs should have "BG" in blue letters on a white background, and "Parkway" in white on blue. Quite a few of these signs are reversed, making them look like the old-style Western Kentucky Parkway signs. Here are a few examples. 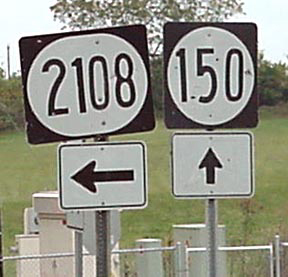 In several spots in the Bowling Green, Ky. state highway district, two-digit routes are signed using the wide-format rectangular sign, instead of the normal square-format sign. 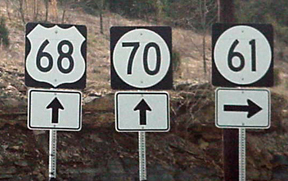 These signs are slowly disappearing, but there are still several US 68 and KY 80 markers which use the wide-format sign instead of the proper square format. 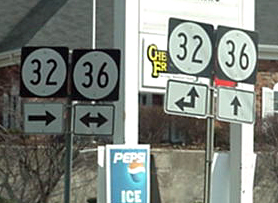 These signs are located at the same intersection, west of Bowling Green, and were photographed in May 1998. On the same date, other similar signs were located at the end of the exit ramp from the northbound William H. Natcher Parkway and at other locations between Bowling Green and Hopkinsville. You have to look carefully at this Mountain Parkway sign to see what's wrong with it. Give up? Well, the little white road or path in the blue portion of the sign is on the wrong side of the tree. It should be on the right side of the tree, instead of the left side. 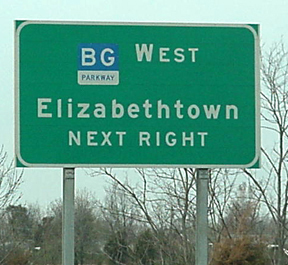 This sign is located on I-64 westbound in Clark County, just before you get to Exit 96. This nice, pretty new sign on the Purchase Parkway tells motorists they're crossing the Bayou De Chien in western Kentucky. The only problem is, the sign is wrong. The stream's name is "Du," not "De." The contractors must not have known the difference. The photo was taken in April 1998. 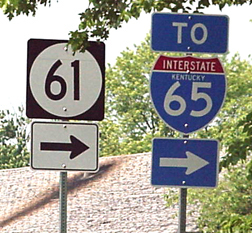 Often, when two routes are joined and signed together, Kentucky will get the directional auxiliary signs reversed. Here are some examples. So, which is it? South US 68, or West US 68? That sign under the "South" plate really should be a US 27 marker, but South US 68 would fit in perfectly in Ohio, where the route is signed as a north-south route instead of an east-west route. These signs are located on US 27/68 in Lexington, just south of New Circle Road (KY 4). 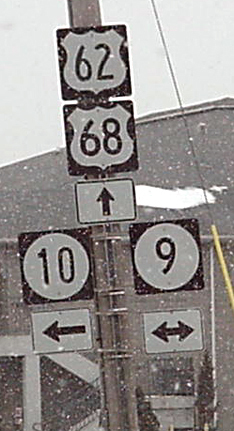 BTW, the rightmost US 68 sign is an old non-reflective marker. UPDATE: This sign goof has been repaired. 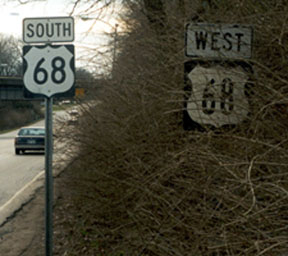 The old US 68 sign (pictured at right) has been removed. The assembly now reads SOUTH US 27, WEST US 68. 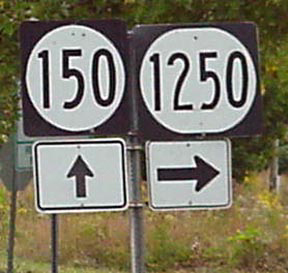 This KY 150 sign, located at Mt. 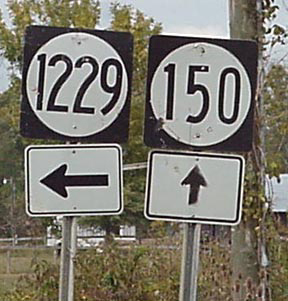 Vernon at the intersection of US 25, US 150 and KY 1249, should be a -- you guessed it -- US 150 sign. The photo was taken in April 1999. UPDATE: This goof had been repaired as of September 2000. 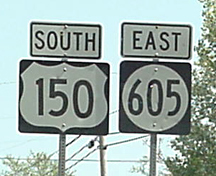 This sign is now the correct US 150 sign, and the peeling KY 461 sign has also been replaced. Here's another KY 150 goof, located just a couple of miles from the one photographed above. This one is at the end of the exit ramp from northbound I-75 to US 25 at Exit 63 at Mt. Vernon, and the photo was taken in July 2000. UPDATE: This goof had been repaired as of September 2000. Is there only one slow moving truck? Promise? On a busy road like I-75, shouldn't that read "Trucks?" This sign is located on I-75 soouthbound in Rockcastle County, just north of the Mt. Vernon exit. 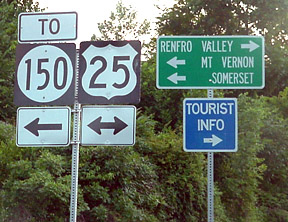 Similar signs can be found in the northbound lanes in Rockcastle County, just north of the Rockcastle River bridge. Photoshop did strange things to the image when I adjusted the levels and blew it up. Someone needs to get the "L" out of here. 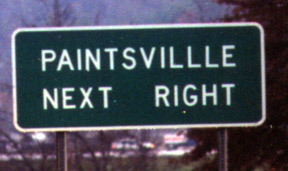 There's an extra "L" in "Paintsville." 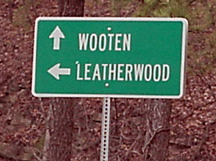 This sign is located on KY 114 westbound near US 460 in Magoffin County. 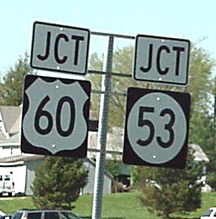 There's a letter missing in one of these signs, located at the intersection of KY 52 and KY 499 near Irvine. I'll let you figure it out. (Note: that's not a "1" in the word "Irvine," but instead it's the bolt holding the sign onto the pole. 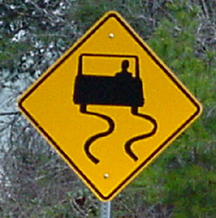 UPDATE: This sign was replaced in the summer of 2001. 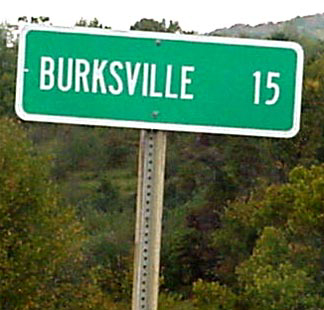 Sometimes you'll find a misspelling on a county road sign, like this one on KY 11 in Wolfe County. 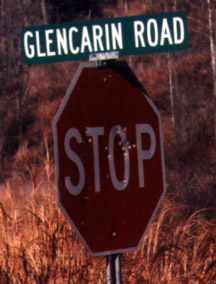 The correct spelling is "Glencairn," not "Glencarin." Was this photo taken in England, or somewhere else where they drive on the right side of the road? Nope, it was taken on KY 1144 in Lee County, Ky., in March 2000. "Dept. of Highway Garage?" That should read "Highways." 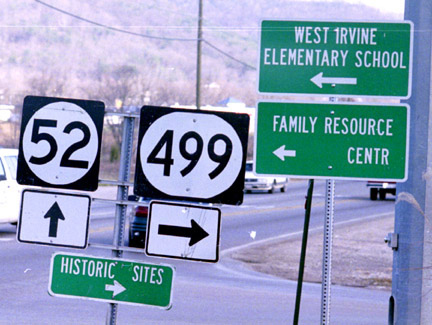 This sign is located on US 68 in Paris, and was photographed in the spring of 1999. 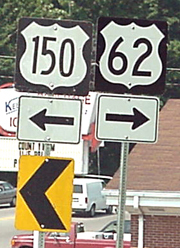 There are two KY 460 signs installed at this intersection in Pike County, instead of US 460 signs. This photo was taken in October 1999. This U-turn sign is installed upside-down on I-64 in Carter County. It was photographed in October 1999. 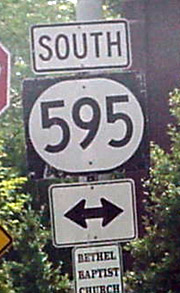 Did you know Kentucky had a US 577? This is supposed to be a KY 577 sign. It's located near Burning Springs in Clay County, near the Jackson County line. (Photographed July 2000). 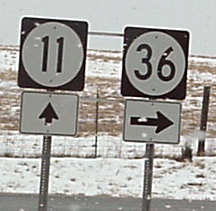 In many cases, the wrong directional arrows are installed with route signs. Here are some examples. 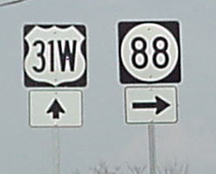 Clockwise from top left, eastbound KY 32 should turn left, not right, when it meets KY 36 in Carlisle (the sign assembly on the right in that photo is correct); there should be a "right-and-straight" arrow under the KY 36 sign where it joins KY 11 south near Sharpsburg; ditto for the KY 88 sign where it joins northbound US 31W near Munfordville; there should be a "left-and-straight" arrow under the KY 63 sign where it intersects KY 100 and KY 163 in Tompkinsville; the same goes for the KY 10 sign where US 62/68 intersect KY 9 and KY 10 in Maysville; the KY 61 sign on westbound US 68/KY 70 needs a "right-and-straight" arrow; the US 150 sign where westbound US 62 meets it in Bardstown should have a "both ways" arrow; the KY 66 sign should have a "right-and-straight" arrow where it meets US 421 and KY 80 near Big Creek; and finally, when KY 61 meets US 62 near Boston, it should have a "right-and-straight" arrow. 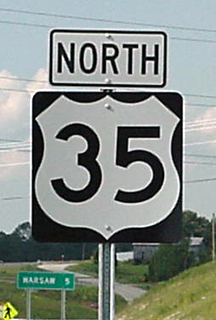 This sign is located on KY 53 northbound at Shelbyville. The KY 53 sign should actually be a KY 55 sign. At first glance,this in Paducah appears to be OK, but in reality, US 62 is not carried on this stretch of pavement. 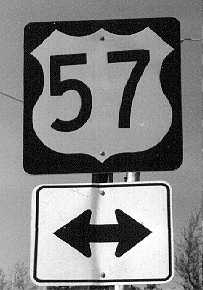 A "To US 62" sign would be appropriate, though, because US 45, US 60 and US 62 meet just a few blocks east of where this sign is posted. 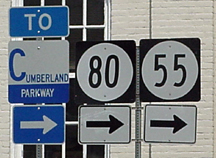 Cumberland Parkway signs normally have the "umberland" located in the middle of the sign, between the points of the "C" instead of at the bottom of the sign. This photo was taken in Columbia (spring 2000). How can one turn either right or left and go south either way? 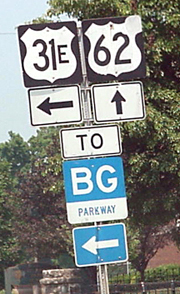 This sign on KY 21 in Berea would indicate that you can (photographed July 2000). 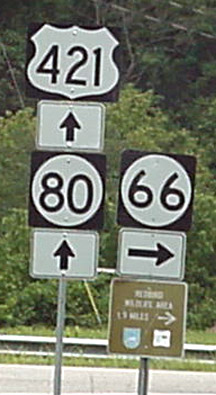 In this case, the truck route is US 60, not KY 89, as the sign on northbound KY 627 in Winchester would seem to indicate.